Originating as brewhouses, many brasseries were started by Alsatians who moved to Paris after their homeland was annexed by Germany in 1871. These establishments kept late hours and served food all day—food that sounds fancy because most things said in French do: fruits de mer, pâté, choucroute garnie, duck leg confit, and mousse au chocolat. Translation: the bottom feeders of the marine world, lowly cuts of offal and meat, and desserts that anyone from a toothless baby to a toothless old man might enjoy. But despite the cuisine’s many humble ingredients, the feel of a brasserie is often glamorous; its Belle Époque origins are apparent in the globe lights, chandeliers, and mirrored bars. Which is all to say that the classic brasserie is an exercise in contrasts. So, too, is Eli Kirshtein’s new Inman Park brasserie, the Luminary, named after Atlanta’s first newspaper, a pre–Civil War weekly that ran from 1846 through 1848. Kirshtein’s is the first restaurant to open in the still-under-construction Krog Street Market, located in what was part of a factory that produced cast-iron potbelly stoves for nearly 100 years (later, the space briefly served as Tyler Perry’s movie studio). Paces Properties is now turning it into a massive food hall, with an A-list of Atlanta chefs signed on as tenants, and vendors such as the Little Tart Bakeshop, Jeni’s Splendid Ice Creams, and the folks from the Spotted Trotter setting up shop. Consciously or not, the design of the Luminary—a mix of fin de siècle elegance and postindustrial minimalism—mirrors the inherent tension between tradition and progress that characterizes Inman Park, a historic neighborhood facing a tidal wave of new construction and its corollary traffic. Period lights extend from the otherwise blank white walls above the leather booths. Slender chairs with curved backs are paired with square pedestal tables. An oversized mirror topped with a row of bare bulbs is framed by the bar, which, true to its brewhouse origins, has a couple of dozen beers on tap. A neon sign announcing the restaurant’s name glows against subway tiles. But before cabaret music starts playing in your head, look up at the soaring twenty-foot ceiling and you’ll see exposed metal pipes. And what are those irregularly placed round lights clustered above the raw bar? Massive pearls? Tiny spaceships? Gaze out the plate glass windows that separate the dining room from the patio, and in the distance, just past Kevin Rathbun’s diminutive Krog Bar, your eye will land on the massive, multistory parking garage under construction. In a sprawling city with an anemic public transit system, where there is development—even a block from the BeltLine—there must be parking. Marinate on that for a minute, then turn your attention to Kirshtein’s menu, which, at first glance, offers iconic French food you might find at any brasserie: towers of seafood from the raw bar, chicken liver mousse, mussels, fish, steak frites. But look closely and you will see that the menu is deceptively wry, loaded with subtle quirks that personalize the cuisine. Take the “Expat snacks,” foods that reference places such as Vietnam where France once, um, exerted influence. One of the snacks is chicken wings “Nuoc Ma’am,” a winking reference to the pairing of wings you might find at Taco Mac—and I mean that as a high compliment—and nuoc cham, Vietnamese sweet and sour sauce. The crispy catfish brandade is a Southern take on a brandade fritter, substituting catfish for the traditional salt cod. Or consider the deli-style pickle that accompanies the croque monsieur (which I wish had less bread and more béchamel) instead of cornichons. In these clever variations, Kirshtein proves that he learned the rules before choosing to break them. With other dishes, Kirshtein sticks closer to the traditional, such as the beef tartare: a patty of perfectly seasoned chopped hanger steak, cornichons, hard-cooked eggs, and Worcestershire sauce. His duck leg confit, propped on lentils du Puy, is an homage to the classic, though I yearned for something more acidic to counter the richness of the meat and was put off by the garnish of hard cubes of carrots. 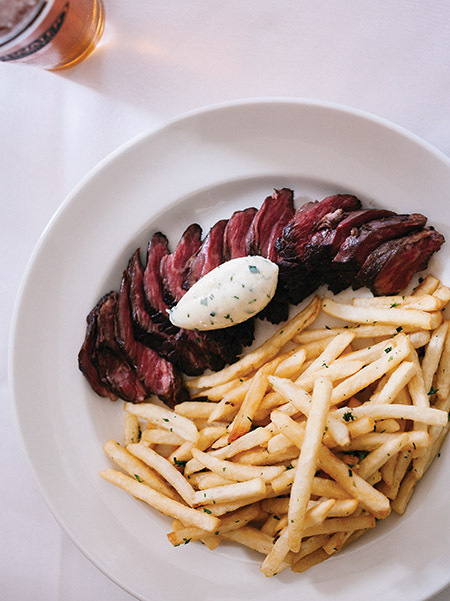 But I’d return weekly for Kirshtein’s steak frites—rosy slices of meat flecked with fleur de sel, gilded with flavored butter, all lemony and herbaceous, and accompanied by killer fries—thin, hot, and crispy. 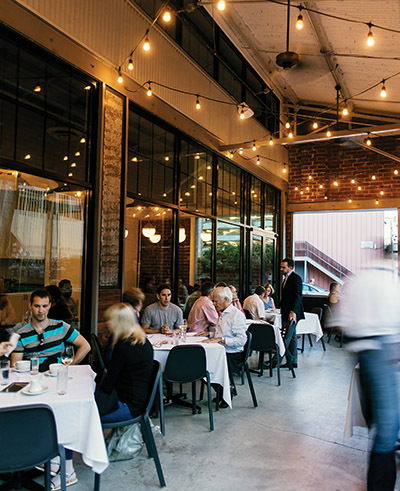 In a city where every new restaurant seems to have some sort of raw bar, I’d skip the Krog Street Platter—two tiers of chilled seafood, including raw oysters, questionable clams, mussels, and shrimp cocktail—and order the peel-and-eat shrimp cocktail instead, a fine display of the sweet treasures of the Georgia coast. The monkfish with leeks hovers on bland, but dip the fish in the sauce Nantua (which Kirshtein creates by combining a reduced lobster and shrimp stock with beurre blanc), and suddenly the flavors meld and marry—and a happy marriage it is. 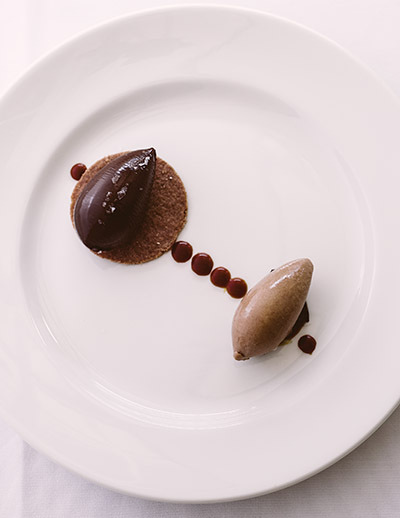 And though I love Kirshtein’s twists on classic French desserts—such as the profiteroles stuffed with hazelnut and coffee cream and his caramelized honey crème brûlée—it is the salty caramel ganache tart atop a chocolate sable crust, served with a quenelle of chocolate sorbet, that has catapulted to the top of my cravings list. As much as I enjoyed my meals, there is a note of artifice to the Luminary. This is in part due to the fact that construction is still going on all around. But even inside the restaurant, I felt a bit ungrounded, almost as if I were on the set of a play that could be dismantled at any moment by the stagehands—strange, considering how steeped in history the Luminary is, located in a historic building in a historic neighborhood and named after the city’s first newspaper. Although the food represents a distinctly Southern spin on the cross-cultural pollination that defines a French brasserie, I still wish that the space itself told a clearer story. The crisp white walls display no photos or artifacts, as if they were blank pieces of paper in need of ink. What story of Atlanta might they tell, of where we have been and where we are going? I’m ready to be illuminated. Hours: Dinner: Tuesday–Sunday 5–11 p.m.; Brunch: Sunday 11 a.m.–3 p.m.